When you move into an apartment without laundry hookups or where the space required for regular laundry machines does not exist, and if the building does not have a common laundry room, you have two options: either you do your laundry by hand, or take it to a laundromat. Clearly, given our busy schedules, both options do not seem very appealing. Fortunately, nowadays, the simple luxury of being able to do our laundry at home whenever we want can be available to everyone thanks to portable washing machines. Portable washing machines provide the convenience of at-home laundry facilities for spaces where full-size machines are not an option. They are ideal for small apartments, mobile homes, RVs, campers, and other places where space is limited and laundry hookups do not exist. They eliminate the need for regular visits to costly laundromats and having to comply with laundromat hours that may not always suit our own. This article will compare the Pyle PUCWM22 and Haier HLP21N portable washing machines. These two washers were top sellers in the portable washing machines category among Amazon buyers at the time this article was written.The good value they offer at their relatively low price may explain in part their popularity. Selected Portable Washing Machines on Amazon. Pyle portable washer is a convenient, top-loading, easy access system that is also equipped with a built-in spin-dryer. It is compact, easily portable and ideal for locations where there is not enough room for a large washer. With its plastic body, it is easy to carry and can even be installed anywhere with water connection and electricity. Even on your kitchen counter, as the built-in spin-dryer does not need to be vented out like your standard dryer units. It is also very simple to operate: just insert detergent and water, and select on the control panel the wash program and wash time. Note that this washer comes with the required hoses and does not need any additional special parts or any plumbing. It is also equipped with a translucent tub container window. - Washer Load Capacity: 7.7 lbs. - Spin-Dryer Capacity: 3.3 lbs. - Washing Motor Power: 250 Watt. - Spin-Dryer Power: 120 Watt. - Dimensions: 22.2’’ x 13.9’’ x 23.6’’. Wash Timer Button: This is used to select the washing time. It can be set to 3, 6, 9, 12 or 15 minutes. Program & Drain Button: This button is used to select a standard wash or a soft wash for delicate items. Once the wash time is completed, this button is also used to drain the machine. Spin Cycle Time Button: This button is used to select the spin cycle time. It can be set to up to 5 minutes. In addition, the control panel has a water inlet hole that is used to fill the machine using the included water inlet hose. An additional hose is provided for draining the water. ​The machine comes with a 1-Year warranty. For exact price information or to purchase this washer, please refer to the Amazon products section below. Haier HLP21N weighs 43 pounds and measures approximately 30" by 17.6" by 17.3". This makes it heavier than the Pyle PUCWM22 washer, but because it has wheels, it is still easily portable and can be taken along anywhere it can be plugged in. Because of its small size, it is very well suited for small apartments, mobile homes even RVs. The capacity of this machine is 1 cu-ft and the stainless-steel tub can take loads up to 6 lbs. It uses a pulsator system rather than the more common agitator based system to create a powerful and effective washing action without the ill effects of twisting and pulling that an agitator can cause. 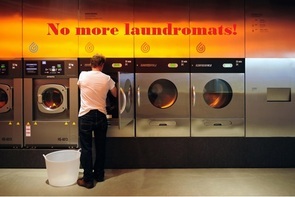 Pulsator washing uses no agitator, but instead "pulses" water through the clothes to clean them more gently. Not having an agitator in the middle of the wash tub also frees up extra space for maximum wash load capacity. The pulsating action results in superior cleaning performance in a non-abrasive and gentler wash environment and makes this washer in particular well suited for delicate items. The control panel is all electronic and with LED indicators. It has touchpad controls for turning the unit ON and OFF, for water level selection (LOW/MEDIUM/HIGH), and for program selection (CYCLE). There is also a START/PAUSE button to pause operation or resume operation if needed. The included inlet hose hooks up easily to a kitchen or bathroom faucet either directly or using the provided faucet adapter. The drain hose needs to be placed into the sink using the provided drain hook. This machine does not have a separate compartment for spin-drying like in the Pyle PUCWM22 washer, but it does have a powerful spin cycle and clothes come out mostly dry. So, effectively the spin cycle of this machine produces the same "almost dry" effect produced by the separate spin-dryer of the Pyle PUCWM22. Additional features include end-of-cycle signal, a removable lint filter, and a clear viewing window at the top that lets you check on your laundry. The machine doesn't use up a lot of energy as cycles are short and effective. Note also that once you select one of the three water levels, you can leave the faucet on as the machine has some sort of stopper that will only run the water when the cycles require. This is a useful feature that avoids wasting water when you need to wash smaller loads. Easy installation kit with Quick-Connect sink adapter. Adjustable leveling legs for uneven ground. Side strap for added mobility. Haier comes with a seven year warranty for the stainless steel washtub and a five year warranty for the outer tub and assembly parts. Labor is covered only for 1 year. ​For exact price information or to purchase this washer, please refer to the Amazon products section below. Which of these two Portable Washers is best for your washing needs? If you are looking for a small size portable washer that will fit in a small apartment, mobile home, RV, etc. both machines will do fine as they are both small and light enough to move around easily. Haier HLP21N is heavier than Pyle PUCWM22, but it has wheels which makes it really easy to move around. Haier HLP21N is a fully automatic machine, and no human intervention is required to pass from the end of the wash cycle to the rinse, drain and spin cycles. They can all be programmed to be executed automatically. Pyle PUCWM22 on the other hand requires that you initiate the drain and spin cycles manually after the wash cycle has terminated. Furthermore, Haier can be programmed to execute automatically a number of different types of cycles such as wash only, wash and rinse only, rinse and spin only, or just spin. To mimic these with Pyle PUCWM22, human intervention is required each time you pass from one operation to the other. 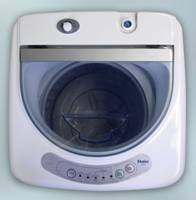 Many are misled by the fact that there is a separate spin-cycle compartment in the Pyle PUCWM22 washer, thinking that a full-fledged dryer is built-in into this machine at such low cost! But the spin-cycle unit built into Pyle PUCWM22 is not a true dryer as it does not completely dry the washed clothes. Both Pyle's and Haier's spinners do quite a good job drying the clothes to a barely damp, but with either spinner, hanging the clothes or drying them in a true dryer is required to get them completely dry (please refer to the Amazon product section below for recommendations on low-cost portable true dryers). Once again, the main difference between the two dryers is that, with Pyle PUCWM22, manual intervention is required to initiate the drying spin cycle. Finally, remember that Haier HLP21N uses a pulsator system rather than the more common agitator-based system used by Pyle PUCWM22. The pulsating action results in superior cleaning performance in a non-abrasive and gentler wash environment and makes this washer in particular well suited for delicate items. So, if you don't mind some manual intervention, and if lower price is a priority for you, you might want to consider the Pyle PUCWM22. Otherwise, we recommend the Haier HLP21N which represents a more sophisticated and completely automatic portable washer. The spin cycles of both washers described above leave the clothes damp. If you don't want to worry about hanging the clothes to get them dry, you may want to consider the following portable dryers that had received great reviews from Amazon customers (they each had received an average rating of at least 4 stars out of 5 stars at the time this article was written). Please click the product of your choice below for product and price information or to purchase. Note that Amazon often provides a good discount with respect to the List Price (if there is a discount, both the List Price and the actual Amazon price will be shown when you click the products below). As mentioned, the spinners that come within the above compared washing machines do quite a good job drying the clothes to a barely damp, but not completely dry. If you don't want to get a drying machine, one practical option to get your clothes completely dry is to get a drying rack. The Pennsylvania Woodworks heavy duty clothes drying rack is made of 100% hardwood and is 60 inches tall when expanded. It's great for hanging fragile clothes, sweaters, towels and blankets. Note that it is easily collapsible for compact storage.